For this review we travel to the bustling ‘Bollywood capital’ of Mumbai in India, where a new breed of business men and women are demanding a very high standard of clothing. A thriving economy and increased personal wealth in this previously third world country, has led to a new market emerging. India is a remarkable place, full of noise and colour and some very impressive landmarks. It has vast expanses of deserted beaches, some incredible countryside and a very friendly people. I guess it is perfectly understandable that a nation whose fascination and fixation with the Bollywood movies – full of glamour, songs and dancing – would also have a deep rooted passion for fashion. Arvind is one of India’s much loved and leading brands with an estate of over 94 stores (thereabouts). It is a unique offer providing a range of premium shirting and suiting fabrics to the discerning customer, as well as a range of premium brand apparel. 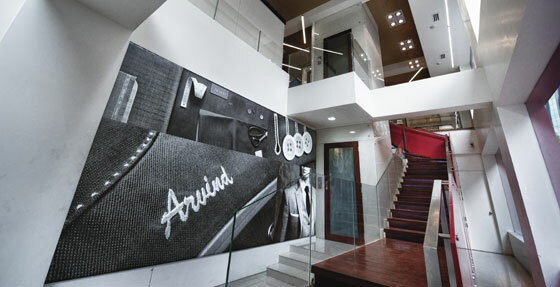 It has recently rebuilt and recreated the Arvind brand in the form of a 4,000 square feet flagship store in Mumbai. This new flagship needs no introduction, it is simply sublime. Looking as if it stepped off the catwalk in Paris or Milan (if this is possible for a building) the new store is perfectly executed. It is highly contemporary with large expanses of white block walls, a phenomenal wooden staircase with glass panelled banister and many juxtaposed internal glass walls. Endless dark wood flooring provides a stark contrast to the sparse, white interior. Numerous strip lights are angled towards the main pathway to lead you through the store and enhance the overall design scheme, whilst individual spots highlight specific displays. Arvind is all about quality, custom clothing and craftsmanship and the new ‘Studio Arvind’ shifts the deep-rooted traditional balance between customers and their ‘masterji’ (meaning who’s in charge). Customers can now design their own clothing instore, right down to the infinite details of stitching, buttons and even include their own name. 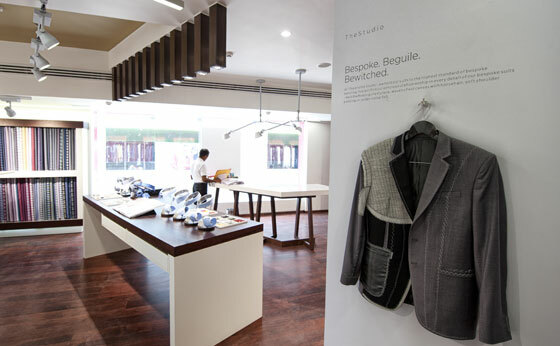 The customer’s instore journey is knitted together with stories celebrating the process and art of tailoring, as well as Arvind’s heritage, style and commitment to quality. At the entrance to Studio Arvind, a single jacket is artfully displayed against a large grey panel with inspirational words printed above in a light, modern font. Beyond, rows of fabrics can be seen merchandised on sturdy, white wood perimeter units edged with dark wood trim. 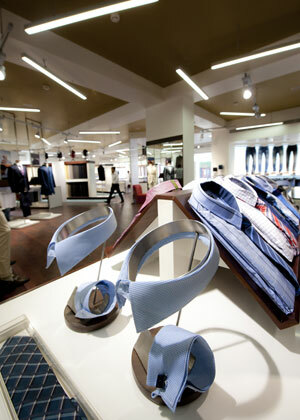 Similarly designed display tables showcase a selection of collars, cuffs and buttons. These are sited below a row of feature spots each individually housed within dark wooden casing. Further panels feature throughout the store and convey short quotes, tasters to help guide you towards your final item. Within the apparel section mannequins are displayed sparingly sited in pairs against grey panels. Busts are individually mounted on white plinths in front of angular frameworks that are suspended from the ceiling. Material samples are displayed on the reverse. Clothing is hung on angular metal rails within wardrobe style, white box units. Folded items are merchandised on large white display tables with dark wood tops. Further garments are displayed on the ultimate hanging rail; concealed beneath a thick glass top – ingenious. The high level of personalisation and craftsmanship inherent in this brand are clearly evident throughout the entire store fitout. Nothing is overdone, everything is considered. 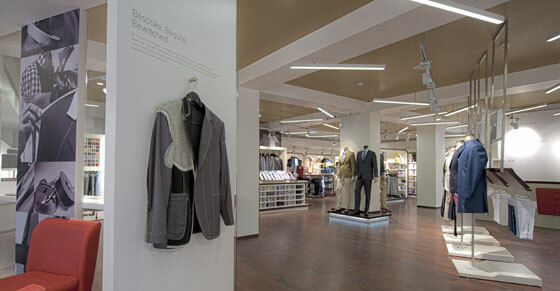 Fitch has created an extremely design led environment for this leading Indian retailer.